Not my bedroom - but I wish it were! My sister once read a book about decorating in the feng-shui tradition, which values decor as a means to joy and harmony. Her source didn't recommend having pictures of anyone in the master bedroom except for the "masters" of the house. Even pictures of kids were off limits, because the master bedroom should be a sanctuary for husband and wife (or whomever rooms there). I don't remember much else about that conversation, except that I didn't want to take my kids' pictures out of my room. My bedroom exudes anything but peace, joy and harmony. As I've mentioned in a previous post, the room also doubles as my husband's home office. And it's also my second office when someone is occupying the guest bedroom which doubles as my first office. We've had a lot of visitors lately, and my work files, folders and textbooks lie on the floor at my bedside. So yes, my husband and I bring work into the bedroom (work actually lives there), and we bring work to bed with us. And not just at night. Sometimes I find hubby in bed with his laptop during the day - he says he needs a break from his aching office chair. * The Double Duty: A two-part adjustable bed by Reverie with built-in outlets (set starts at $5,999), allows one person to work while the other snoozes. * Pseudo Beds for the Office: Office-furnishings firm Steelcase is marketing feet-up work furniture. * Surf Like an Egyptian: This pyramid pillow, available at levenger.com ($39), can prop up a tablet—and keep stray pens from getting lost in the sheets. * Mattresses that are larger than standard sizes, so couples have more room to lay out papers and devices. 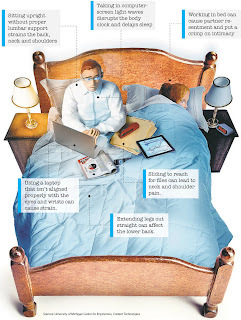 ...Many people who bring laptops or other devices to bed get stiff necks or backs from holding their bodies in strange positions, propping themselves up on their elbows or rolling around trying to get comfortable. Tapping casually on a smartphone or tablet touch screen in bed is less likely to cause ergonomic problems than multitasking intensively on a laptop. But working on any mobile device in bed for more than an hour without lumbar support, with the neck bent forward too sharply, or with the arms and hands suspended at an awkward angle, is likely to cause aches and pains. 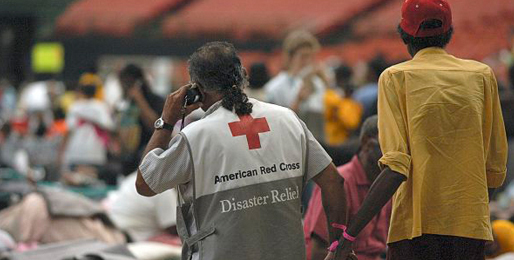 Hurricane Sandy may have been "last month's news," but thousands families are still in need and are still hurting. And many kids are still asking questions. Perhaps they're worried for their safety, worried about another storm. Worried that something bad will happen to them, like it happened to the people in the path of the storm. Maybe they're asking "why me?" As a parent, I'm often at a loss for words. So here are some words (not my own) that can help you help your child. Depending on your child's age, sensitivity, and questions, here are some tips about how to reflect on the disaster (or other events). This is quoted directly from Kim Lee, a church leader at South Mecklenburg Presbyterian Church in Charlotte, NC. Take pieces of this that relate to your family's faith background. It can be so helpful. "Last march it snowed and then it rained for four days and nights. 'It'll come a tide,' my grandma said. And sure enough… it did." Come a Tide by George Ella Lyon is the heart-warming story of a small but hearty mountain community experiencing a flood. "What do we do now?" comes the plaintive cry after the rain stops and the sun comes out. "If it was me," Grandma said, "I'd make friends with a shovel." And so they do, neighbor helping neighbor. Strikingly, George Ella Lyon writes in her dedication, "For friends and neighbors in Harlan County, Kentucky and for everyone who ever dug out." Along the eastern seaboard, it has come a tide! And, with all the news coverage about the calamity, our children may be inundated and overexposed to news coverage, pictures, and frightening conversation. We, along with our children, are called to be Christ's light in the world for our brothers and sisters impacted by this devastating storm. It is important to provide careful and thoughtful spaces to talk about and act on our concern and love for those who are suffering. Story books can be a wonderful way to reassure children that God can be trusted in the midst of a storm and engage children in faithful conversation as we consider how to assist God in God's reconciling activity in the world. Here are some tips to help guide you as you journey along with your children through the horror and uncertainty that mark disasters. Read the story Come a Tide. You may purchase your copy by following the link to Amazon http://www.amazon.com/Come-Tide-George-Ella-Lyon/dp/0531058549 or you may borrow my copy. Say: God gives to us the gift of relationship. God first reaches out to us and in turn gives us the wisdom, strength, love, creativity, and desire to reach out to one another. Ask: What do you think about the story? Have you ever seen a flood? What does Grandma say? What happens to the houses, the neighbors, the pigs, and the chickens when the creeks and the river overflow? Where does the family go? Who takes care of them? What happens there? How do the Mac, the Cains, and Papa Bill take care of one another? How does God want us to treat our neighbors? What things are you good at doing? How could you use the things you are good at to help someone? Older children can look for other Scripture stories and prayers that offer thoughts of God's power and love. Write and/or draw letters and prayers for children's worship. Provide a safe and quiet space for them to talk and express their concerns. Important faith values that are understood by children include the personal and protective love of God. Stories of Jesus' love for others and parables of his care for others are especially helpful. Light a special "healing" candle each evening for family devotions or meal times. Speak of the Light of Christ and how God's love will never go away. Find out what our denomination is doing to help those suffering in the aftermath of this hurricane by clicking on the following link http://www.presbyterianmission.org/ministries/pda/making-gift-heart-kits/.